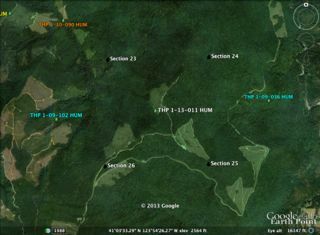 THP 1-13-011 HUM (K&K 940 14 THP) Green Diamond Resource Company, 53 acres; 83% clearcut, 9% no-harvest, 6% roadside, 2% selection logging. Panther Creek (HUM: T8N R2E Sec.23, 24, 25, 26). Wet weather operations, moderate erosion hazard, steep slopes up to 85%, steep roads, impaired 303.d watershed, coho watershed, herbicides, 8 spotted owls within 1.3mi, trees up to 30” dbh. Estimated public comment deadline: 03/23/13. This THP is north of Eureka, CA, about 10 miles east of Highway 101 and the town of Westhaven on the Coast Range. Green Diamond Resource Company is planning a mostly tractor and cable clearcut logging operation on some very steep slopes up to 85%. The THP is in the Panther Creek watershed which has a long history of intensive logging and is listed as impaired for sediment and temperature. Panther Creek flows into Redwood Creek which is an important coho salmon, steelhead and coastal cutthroat trout fishery. More information is available on the THP Tracking Center website.